The problem is that the spring that retains the glass is gone missing. I glued the pieces together and made a new spring. But i don't know if it's strong enough... will see tomorrow on the road. I broke my mirror. My fault as I didn't have the door restrainer connected, and the mirror pushed against the body of car. Hadn't realised and have lost the spring. 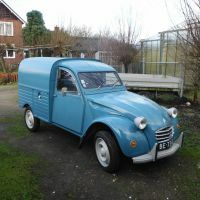 You could look for a replacement at the A markt, Citromobiel, Merksplas or A t/m ZX markt , or any other event . But it is a shame that it went broke. Friend of mine broke the mirror on his 25 year old BMW motorcycle. They wanted a ridiculous £58 for a piece of mirror glass. So he bought a piece of mirrored plastic from Ebay for £2.99, and cut it to shape. The local glass firm did cut me a mirror to size for the landrover for 10 euros. I am disassembling the broken gearbox. A few parts are still ok. Here the cuplrit of it all. The pignon did loose some 5 half theeth... and one af them fell between the gears..
Wow! What would cause that?